A Dolly Varden in striking spawning colors. Dolly Varden have been much maligned as a predator of salmon. Although they do eat salmon eggs, they are more scavenger than predator. The Dolly Varden is one of the most beautiful and diverse fish in Alaska. Some spend their entire lives in freshwater lakes or rivers. Others spend part of the year in saltwater, a few months or just a few weeks, but spawn in fresh water. In some populations, only females migrate to sea, growing larger and producing more eggs before returning to their home water and spawning with the small resident males. There are even populations of dwarf Dolly Varden in many parts of Alaska. 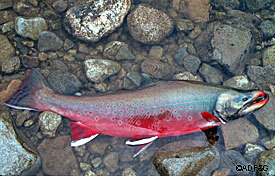 In spawning colors, the Dolly Varden is perhaps our most striking fish. The name “Dolly Varden” stems from a character in the Charles Dickens novel, “Barnaby Rudge.” Dolly was a young girl with a rosy complexion. In the late 1860s a popular green fabric adorned with small crimson polka dots was marketed under the name Dolly Varden. A 15-year-old girl named Elda McCloud is credited with connecting the name Dolly Varden with the fish. McCloud’s uncle, George Campbell, was the proprietor of the Soda Springs Resort in Northern California. Upon viewing the catch from a successful fishing trip to the upper McCloud River (tributary to the Sacramento River), the girl remarked that bull trout was a poor name for such colorful fish and that they would better be called Dolly Varden. Whether young Elda had recently been making a dress from the spotted fabric, or had recently read “Barnaby Rudge,” remains unknown, but the name caught on and has been with us ever since that eventful day. However, the story is one of misidentification. Bull trout and Dolly Varden are two different species. The Dolly Varden found in Alaska, Salvelinus malma, were never present in the McCloud River. The fish likely viewed by Elda McCloud were in fact bull trout, Salvelinus confluentus. Bull trout and Dolly Varden were confused by anglers and biologists until 1978 when Ted Cavender of Ohio State University demonstrated that bull trout was a valid species separate from Dolly Varden. At that time the world record Dolly Varden (32 pounds) from Lake Pend Oreille, Idaho became a record “bull trout”. Misidentification has not been limited to the southern extreme of the Dolly Varden’s range. In the north, Dolly Varden and Arctic char have been confused by anglers and biologists. To address the identity problem we must go back to original species descriptions. Carl Linneaus, the famed Swedish naturalist and the founder of the modern classification system for plants and animals, first described Arctic char, Salvelinus alpinus, in 1758 from specimens in an alpine lake in Swedish Lapland. Therefore, any fish that fits the original description is considered an Arctic char. Arctic char occur across the northern regions of the world, and three subspecies are present in North America. The Arctic char is a lake (lacustrine) species, which has anadromous forms present in many areas. Anadromous Arctic char generally spawn and overwinter in lakes, then move to sea in summer to feed. Dolly Varden were first described by Johann Walbaum in 1792 from Kamchatka, Russia. Dolly Varden are a riverine species in northern Alaska, and anadromous Dolly Varden generally spawn and overwinter in flowing water. The common anadromous Dolly Varden in Kamchatka is the same species as the anadromous char found in western Alaska. The Dolly Varden is one of the most widely distributed salmonids in Alaska. It occurs throughout the coastal areas of the state from southeast Alaska across the Gulf of Alaska and the Bering Sea into the Beaufort Sea to the Mackenzie River in northern Canada. It also occurs in streams in Interior Alaska and the Brooks Range. There are two forms of Dolly Varden in Alaska. The southern form ranges from southeast Alaska throughout the Gulf of Alaska to the south side of the Alaska Peninsula. The northern form ranges from the north side of the Alaska Peninsula northward to the Mackenzie River in Canada. Recently some char from the central Canadian Arctic drainages of the Tree and Coppermine rivers have been identified as Dolly Varden. Arctic char occur there as well and whether the current Arctic char angling record of 32 pounds 9 ounces from the Tree River will be reclassified as Dolly Varden remains to be determined. Southern-form Dolly Varden differ from northern-form Dolly Varden in number of vertebrae (62-65 for southern form and 66-70 for northern form) and in number of chromosomes (82 for southern form and 78 for northern form). In addition, southern form Dolly Varden generally overwinter in lakes, but northern-form fish overwinter in rivers. Stream-resident and lake-resident populations are present in both forms but lake-resident northern populations are rare. In addition, northern-form Dolly Varden can attain a much larger size than southern form fish. The current Alaska angling record from the northwestern part of the state is 27 pounds. Dolly Varden have been much maligned as a predator of salmon. From 1921 to 1941 there was a bounty on Dolly Varden in Alaska. It was terminated when analysis of the 20,000 tails submitted for payment in 1939 revealed that more than half were from coho salmon, and of the remainder, more were from rainbow trout than were from Dolly Varden. Although Dolly Varden do eat salmon eggs and salmon fry, they have not been found to be significant predators in areas where their feeding habits have been studied. They primarily eat drifting salmon eggs that would not have hatched anyway. They are more of a scavenger than a predator. In fact, they perform a beneficial hygienic function, eating dead or fungus-infected eggs that could infect the entire redd (spawning nest). In cases where they eat outmigrating fry, Dolly Varden primarily feed on pink salmon. Their ability to capture these is directly related to fry abundance. Thus, more fry are eaten when large numbers are available and the overall effect on the population is less significant. When other fish such as Arctic char, cutthroat trout or young coho salmon are present, Dolly Varden have always been shown to be the least effective predator. Despite all the confusion, misidentification and misinformed slaughter, Dolly Varden remain a widely distributed, beautiful, diverse and sought after species that provides high quality sport fishing opportunity throughout Alaska. International Society of Arctic Char Fanatics.